Facebook Messenger is way more than an instant-messaging app nowadays. Messenger has stories, group chats, GIFS, video calling, voice calling, stickers, event-planning, games - all that good stuff. Messenger also has bots; those software apps which are cool but kinda creepy with their automated replies (we introduced you to Domino's Pizza's bot a few months back), and they seem to be advancing more and more along with the development of AI technology. I first clicked the standard 'Get Started' button, and Apple Music greeted me with some information on what I need to send to get recommendations, alongside their current editor's picks with the option to listen or share. A menu also popped up where I could choose to send a message, view Editor's Picks (again), or check out New Releases. The 'More' section offers help and more information on Beats 1, (Apple Music's live radio station) and how to try out Apple Music if you're not already a paying customer. I decided to be pretty unsociable and simply send an emoji first, just to see how the bot would react. I went for the standard Guitar emoji, and got the response I expected which was a link to their editor's picks of Rock tunes. So far, impressed. I then took note from their first lot of advice and entered an artists name. The response I got was a collection of albums and EPs from said artist - pretty cool huh? However I do already have these albums from this artist and was hoping to get recommendations or extra options based on the artist (like you do on the Apple Music app). 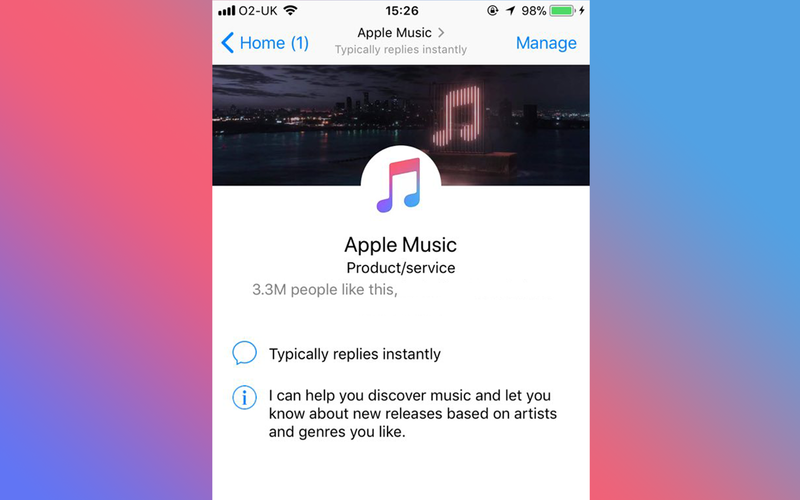 It does therefore make me question if searching for an artist through the bot is actually useful; you can do this directly through Apple Music and playlists and music videos also come up in the search results. 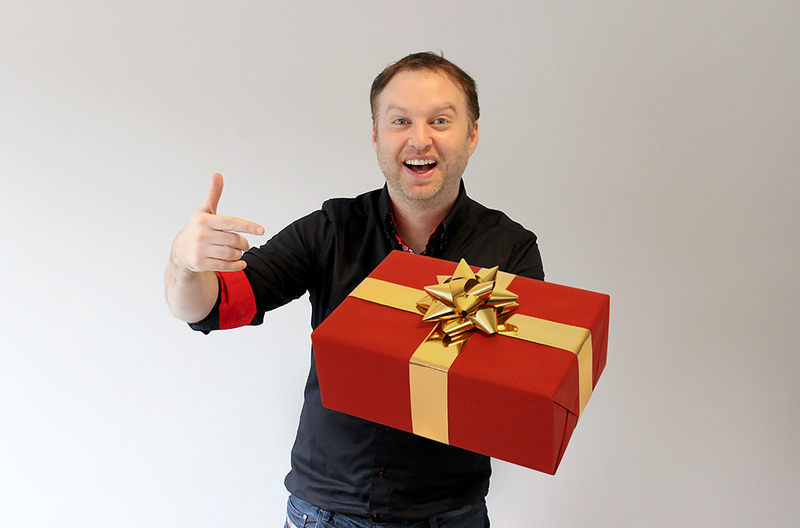 What the feature seems to be more useful for though is the sharing aspect. 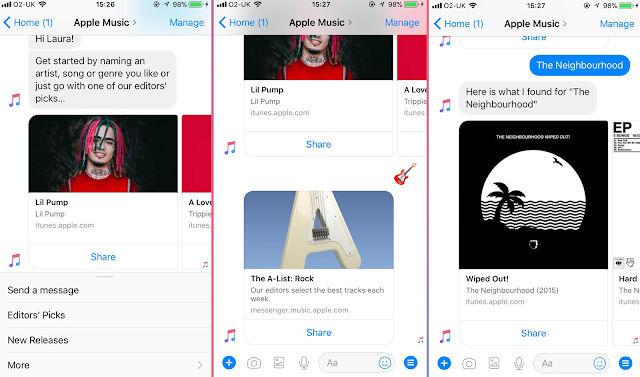 See in the screenshots above how Messenger have added Apple Music as an Extension, where you can directly share an artist, playlist or song etc. to your Messenger chat. This eliminates the need to open up Apple Music seperately and do it the long-winded way; this is one Messenger extention I can see myself using, as it really makes sharing music easy.